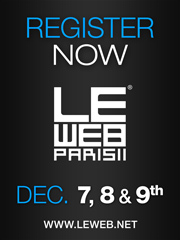 Last year I attended Le Web Conference in Paris for first time. This conference rocks! It is the largest European conference in the web marketplace. There is a place in there for a diverse range of audiences: inhouse marketers looking to keep abreast of Internet developments, digital marketers looking to learn new things and meet contacts, entrepreneurs looking to establish new partnerships and expand their business, start-ups looking to promote their ideas to potential audiences and business partners. This year LeWeb 2011 expands onto a 3-day conference on 7, 8, and 9 December, and the theme is SOLOMO, which stands for Social-Local-Mobile. Tickets are still going at €1490 until end of September. However if you are a freelance developer, a student or a startup, there is a special price for you. Read about it at the bottom of the registration page. Further, if you are a start-up and want to join the startup competition, the registration is open! I enjoyed this conference so much last year that I wrote a blog post covering the highlights of LeWeb’10 on the Youmoz section of SEOmoz, and a more detailed one on my own blog.